I’ve been receiving a lot of pink goodies lately so I thought of doing a “new in” kind of post–pink edition. I’m such a girl! Just a bunch of random things I’m already abusing as I type. You see that pink Native Union handset from Moshi Moshi? It’s so handy! I use it at my office all the time whenever I converse with someone on my iPhone. And it’s such a cute and quirky office desk decor as well! The pink portable speaker below it is probably my favorite gadget right now. I use it for my iPhone ALL the time too–usually for my concerts held at the bathroom!!! Haha! Oooooh yeah!!! Of course I have my vanity case in pink too! Zebra + pink cosmetic case from Avon holds my kikay essentials. For my jewelry, I got these jewelry cases from SM. They feel so luxurious! I love that they’re in hot pink suede. They make organizing my overflowing accessories that much more bearable. The cute strawberry like thing beside them is a key holder. I place all my small keys in it so that they won’t scratch my precious items inside my bag. Plus, it makes it easier for me to locate my keys inside my bottomless pit of a bag. Lastly, a pair of cute pink glasses from Gucci. Before you ask, yes they do have grade. With glasses like these, who’s to say I’m a nerd? I’M A HUGE FAN OF YOURS!!! hi camille! where did you get the key holder? it’s so cute!! thanks! Ate Camille, naiiyak ako sa kilig. Eksaherada lang! But I really love you talaga! Thanks! Come out of the closet and join the club! super love the pink staff. so girly!!! i mean stuff. hehehe. typographical error. charot!!! I want that phone thing! I dont know what you call it but i want it! And the speakers! They sent you great stuff! Yes we do! Thanks Danielle! that telephone thing is soooo cute and it’s genius!!! 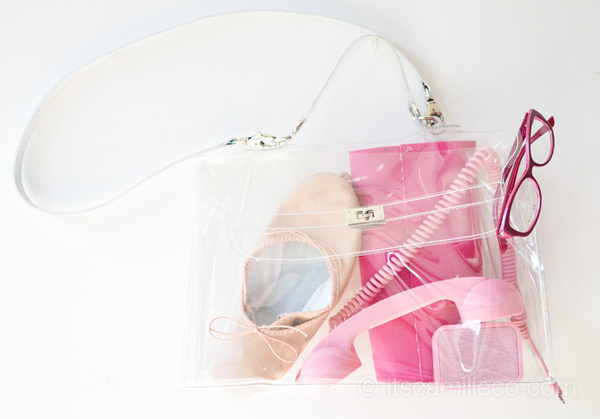 Hi Camille, thank you for including my Chiara Transparent bag in your post!! :) It actually blends in with all your “new” things! haha I look forward in seeing how you incorporate it in your outfit!! It will surely look smashing! God bless you! My very new purchase shall be a black blazer from Zara! Been thinking about it for the past few hours:( Shall go back tomorrow to get it! Haha awwww :) Thanks Bjorn! Thanks Isa! Pretty in pink indeed! Wow! 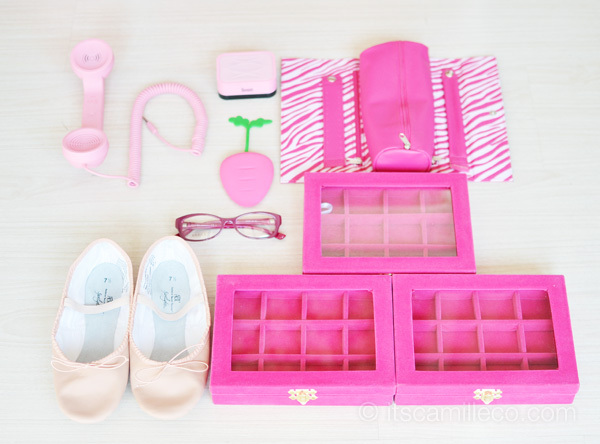 So much pink stuff! I like it in PINK too! Yay! Hi Camille! I love the jewelry cases! *-* For how much did you get them? Oh no, I don’t remember exactly but I remember them being affordable which is why I got 3 haha! ms camille i like your pink stuffs! adorable :D love it! I think pick is so pretty and cute! we have the same pink cosmetic case from Avon! The bag reminds me of Hermes! The genuine one is really expensive. That would be a good alternative. Speaking of Hermes, when will I see you carry a birkin or a kelly? :D Don’t you have one? You should buy! It’s such a classic! That’s really heart breaking :( chos! haha! Hope you change your mind! :D Not even an ounce of love for Hermes? :( You probably never gone to an Hermes boutique? cutie! This color really suits you!